Coming to the end of a big journey like this is bitter sweet. The feat of actually finishing is one thing, however the fact that it is over is another thing all together. When you add to the fact that you are departing Fiji, well it really is a mixed feeling. We both loved Fiji and wanted to spend more time, but home was calling and the need to get home and get back to the reality of work was real. After saying our farewells at Plantation Island we headed north to get out of the reef. Usually you would have gone south and gone through the reef next to Namotu (Wilkes Passage) however it was blowing 25+ so heading off downwind was a lot easier than punching into the wind. Winding our way through the reef, whilst sailing into the sun is not ideal in Fiji with the charts being pretty ordinary, however I knew this route so felt comfortable with it. On exiting the reef the swells were rolling along the coast and the wind was beam on so we were fairly heavily reefed and flying. By nightfall the winds had abated and come aft a little, allowing us a bit further south. Our trip plan was pretty simple, get to the Isle of Pines off Noumea and then see what the weather was to Brisbane. The weather for the second half of the trip had been changing rapidly and it still looked a little unsettled so if the weather was bad, we would make a pit stop in the Isle of Pines and then move on when conditions improved. The first few days of sailing was quite magical. The wind was in, the boat was cruising along nicely and the miles were being ticked off quite quickly. All the time you are thinking of home and the list of things to do. In fact my mind was so occupied with this that I had to write it all down in order to be able to sleep. I actually read very little on this leg, there was just too much to think about. 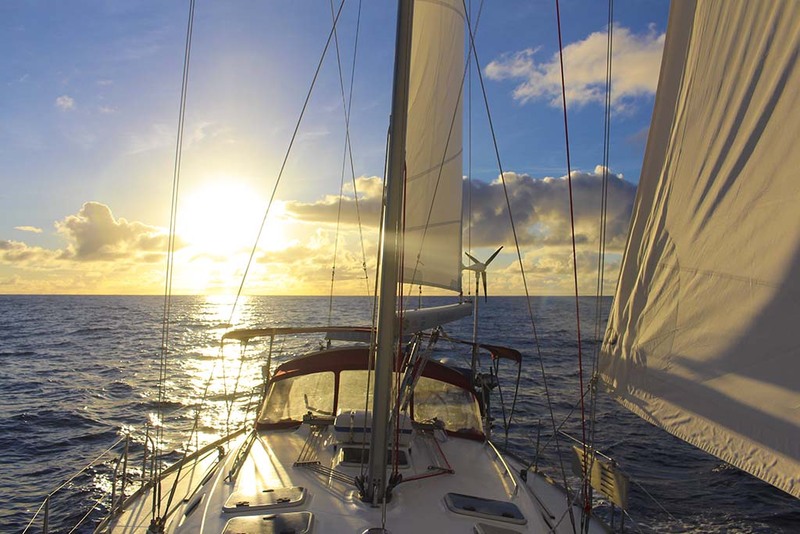 The distance home was 1450nm with 675nm being the distance to Isle of Pines. We reached the Isle of Pines in just under 5 days and the weather had improved out of sight. The trip to Brisbane was looking good for a direct route, no stopping. This was a good thing as we both now wanted to be home in Brisbane. Whilst stopping in the Isle of Pines would see us in another piece of paradise, that was not our mission now. 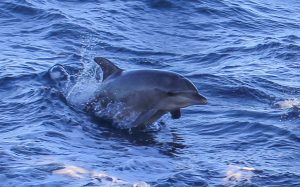 As we approached Noumea we started to get some visitors. 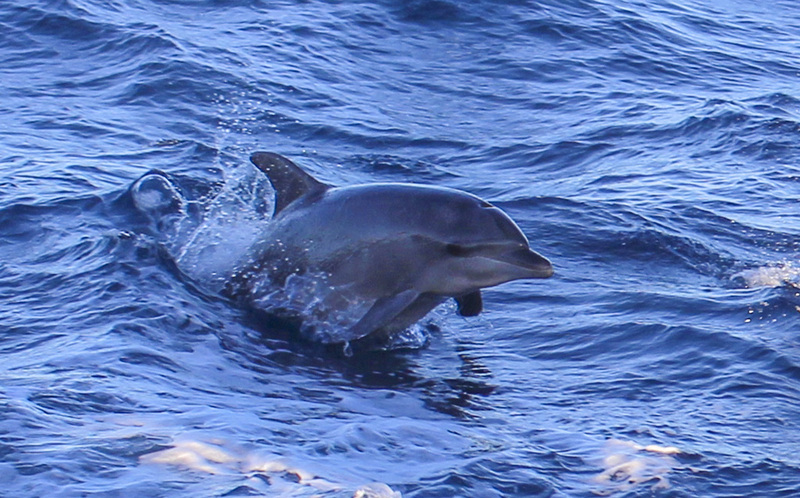 The dolphins were on the bow frequently, whilst one night we had a boobie bird come and sit with us. He sat on the tender all night and flew away in the morning. The next day we would start to have a few issues with them. 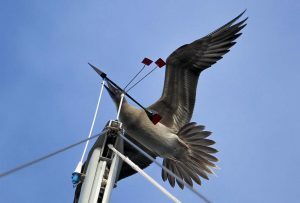 They are usually quite friendly and fly around the boat with no issue, but for some reason they all decided that they wanted to attack our VHF aerial. I have absolutely no idea why but one after the other they would swoop in and take a bite at the aerial. They managed to move the upwind guides on our wine vane, luckily they didn’t take it with them. This continued on all day. We tried everything from banging the rig, blowing the air horn at them and even yelling but it didn’t matter to them. They just kept on going about their attack, one after another. Finally night time came and they disappeared. Our fishing efforts between Fiji and Noumea were back to the usual, catching nothing, however not long after Noumea we got a hit. It actually had quite a pull to it as I wound it in, yet it hadn’t run on the reel, I just saw the reel bouncing. What we caught was exactly why we did this trip. Out in the deep blue sea with nothing around, we pull in a plastic bag. It was pretty photo-degraded already and breaking up into smaller pieces so we only had bits of it on the hook. It doesn’t matter where you are in the world these days, plastic is everywhere. The fact that 95% of large fish in the ocean are believed to have consumed plastic particles means that our habits need changing. We are eating plastic when we eat fish, there is no doubting that. As the plastic is breaking down into mirco-plastics, the same size as plankton, the fish food chain ensures that the big fish that end up on our tables or in the tins at the supermarket, have a plastic content. If you love fish, then maybe it is time to use less plastic. 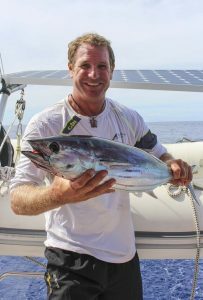 Needless to say, we love fish and actually caught a beautiful 6kg Bluefin Tuna, our last fish for the trip. Once we had him, the rods were put away for another day. 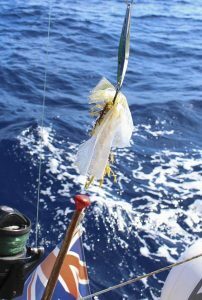 We had caught some great fish along the way, however I wouldn’t rely on me to feed you if we were out sailing. My strike rate isn’t enough to rely on fresh fish for your diet. Two days out of Brisbane and the weather forecast showed light winds. That was O.K, we had plenty of fuel for the run home. Being this close we would simply put on the motor and head on home. However the wind had something else in store for us. Blowing from the south east when we started, by this time it had switched to the east. It then continued to back to the north and then north-west meaning we were sailing on the beam. Then it continued to back and hence we were heading upwind. We kept bearing away as the wind was forecast to continue right around to the south. When the wind had gone to the south-west we tacked. The problem with this is that we were now heading directly into the waves from the old wind. It was a nightmare. The boat was pounding and we tried to slow it down to ensure it didn’t launch off the top of waves. This went on for a whole day as the wind kept backing to the south. We had to keep changing direction too as we still had to get slightly south of west to get to the top of Moreton Island. As the wind hit the south it died away and eventually the swell did too, so the engine was engaged and off we went. Off the coast of Moreton Island we had to avoid a fishing boat that was laying his lines out in front of us, first sign of civilisation. Then as we kept motoring the wind started to build again, directly from Brisbane. It was only 10 knots but it was annoying that it was directly from where we wanted to go. Lucky we were only a day out. In the early hours of the afternoon we saw our first sighting of Australia. Moreton Bay rose up in the distance and it was an awesome feeling. Even though we were still a long way from Rivergate Marina where we were to check in, neither of us could sleep. The next sighting was the Glasshouse Mountains. Anyone who has sailed this coast knows they seem to last forever. We saw them well before we saw the land in front of them. We rounded the north east channel marker right on night fall and slowly made our way down into the way. We were home, in the bay of Brisbane. It was pretty cool and being able to talk on my normal phone really proved we were in Australia. The trip down through the bay was calm with very little wind or traffic. The one thing that we realised pretty quickly was how cold it was. Having spent the last year sailing around the equator and the 2.5 years prior up in Darwin, to come into a place with 10 degree overnight temps, well it was a bit of a shock to the system. Entering the Brisbane River it was just before midnight. We would once again, successfully arrive in the middle of the night. Pulling up at Rivergate Customs dock at 0045, we had made it. Croatia to Brisbane, Tick. Atlantic Ocean Crossing, Tick. Pacific Ocean Crossing, Tick. One day I will work out exactly how many miles we sailed, but for now, it was time for a beer and a wine and to sit and relax before a quick sleep, customs were due in the morning at 0600. In our next edition we check into Australia and start the process of getting our life back into one place. 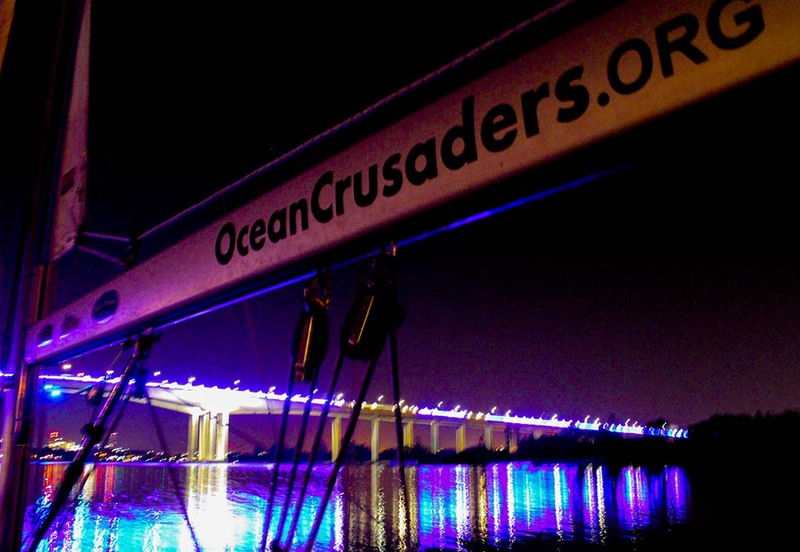 Ocean Crusaders are out to change the way people treat our oceans. 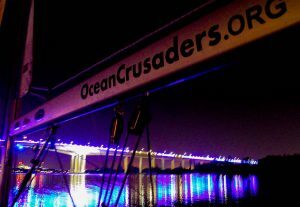 Our online education program is free to download at www.OceanCrusaders.org/education where children can learn of the issues our oceans are facing and how they can make a difference. The Plastic in the Pacific Crusade is about educating the South Pacific Islands, finding out what is happening in these islands and updating our programs. If you missed the earlier editions please go to category file in the footer to go back and read them. They are listed under Plastic in the Pacific.